Lisa Quintana's thoughts and ideas about living with cancer. As a stage IV breast cancer survivor managing to stay alive since her stage IV diagnosis in 1997, and after living with Breast Cancer for 20 years...I thought I'd share my experiences. Last spring, much to my surprise, I developed lymphedema in my hand 17 years after having the axillary dissection to remove lymph nodes to test to see if the cancer had spread. I only had 13 removed and the surgeon said then that lymphedema was less common than it once was. Lymphedema is the swelling of a body part (usually arms and legs but I've heard of others who have had damage to their lymphatic systems elsewhere have developed it). In Western countries, the most common people to get it are those who have had axillary dissection and/or radiation. The lymphatic fluids aren't carried away because the pathways have been disrupted. 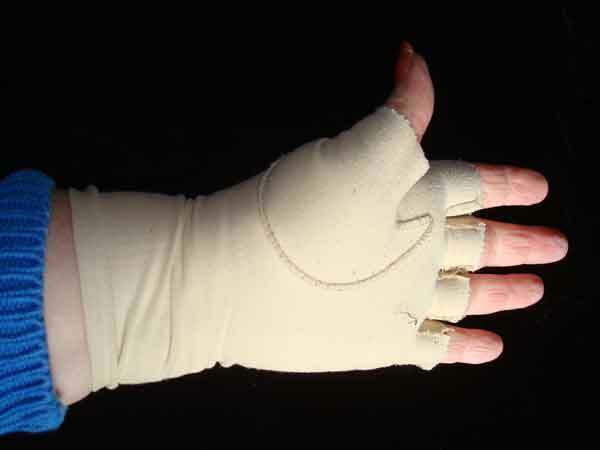 They collect and cause swelling, often resulting in pain, and can result in thickening of the skin and other problems. I didn't give it much thought, but was careful to not allow blood pressure to be taken on that arm since that can cause lymphedema. This spring, I was appalled to notice that my hand had swollen. I was on chemotherapy and developed an infection in my fingernails and that brought on the lymphedema. 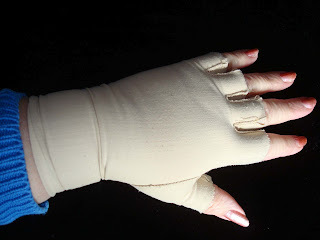 It wasn't terribly serious, but I was worried and went to one therapist who fitted me with the above glove. She told me that if the fingers on it bothered me, just to cut them off. Not exactly thrilling to look at, is it? In fact, I looked like a moldy Michael Jackson. I also felt like it didn't do much. Granted, it seemed like the swelling was pretty much limited to my hand. After one visit, and the glove I went on my way. It seemed like it was getting worse, and I decided to to to a different therapist. That therapist gave me a lot more exercises and explained that sometimes the lack of range of motion and tightness of the muscles increases lymphedema. She also told me about Lymphedivas compression sleeves and gloves, which are called gauntlets (yah, as in throw down the... :) ). As I mentioned in my original post, Rachel Levin Troxell, and Robin Miller, breast cancer patients who suffered from lymphedema started Lymphedivas because they wanted a more stylish alternative to the compression sleeves and gloves out there. Robin left the company in 2007, and Rachel continued. One of my high school friends commented that people saw her lymphedema sleeve and thought she was a burn victim. It's bad enough all the indignities that cancer survivors have, we don't need another ugly garment as well. 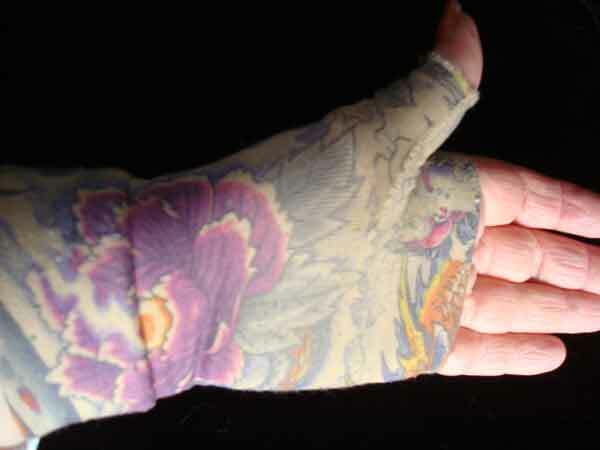 Lymphedema sleeves and gloves aren't cheap..In fact, when I originally posted, I commented that I would have to wait or that maybe Santa would be nice. Well...that comment got the ball rolling. Long time biking buddy Jean Zaniewski who married our best man contacted Lymphedivas about getting a gift certificate to give me for Christmas....they didn't have any. When she told them about me and about the blog, Josh Levin, Rachel's little brother and president of the company emailed me and said that he'd provide a set so I could review them here. One of the things which I thought was cool first was the fact that you could get them in skin tones which would more readily match your own skin tone. 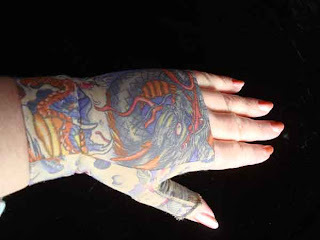 I just couldn't imagine a darker skinned person being happy with a sleeve or glove the color of my first one. Josh said that that was the point, but that they are stamped with the color, rather than being dyed in the yarn or cloth so there is an issue with some un-evenness when it stretches or on seams. 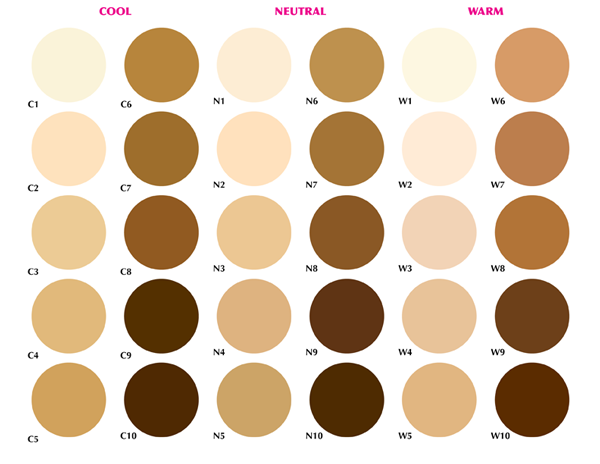 I must admit, I wasn't interested in the skin tones...I wanted FUN. I mean really, if we have to wear these things, let them be fun AND comfortable. Here one of their models is wearing a leopard print. Take a look on the website and see all their patterned pieces. But I do have an unconventional streak and the blue lotus tatoo is what I have chosen. I'm a visual person, and most of the comments I've gotten from people have to do with the fact that they think I have a tatoo! One lady looked at the back of my hand and said "Oh, that must have hurt....wait, it's NOT a tatoo!" I admit, it made me giggle. Here's the gauntlet after I wore it about the same amount of time as the ugly one above. Both were washed the same amount of time so you can draw conclusions as to the wear-ability of one, over the other. The Lymphediva's version was very comfortable and I felt it was DOING something. Since I got these in winter, I can't speak to how cool they are, but they are made from fabric from the trademark owners of Lycra and Coolmax, both of which are old friends of mine from my bicycling days and I can attest that this is better than the stuff the other thing was made from. There is some pilling on the hand of the Lymphediva product, but it isn't as bad as the one on the other and you have to understand I use my hands A LOT. I wear it when I'm cleaning house, sewing (I'm a quilter, so you want to talk about pins??? ), brushing the cat, blah blah blah. No holds barred here. I don't think any fiber can make it through my work out unless it was Kevlar, and that wouldn't make a very good lymphedema glove. Their fabric is made of a 360 degree stretch knit which prevents binding, and certainly I haven't experienced any of that. Aloe vera fabric finishing has been added (unscented) to help moisturize. I don't know how effective this is over time, I wonder if it would eventually wear/wash out....but I really can't fault the comfort of these! Rachel developed these items because she felt that they wouldn't do any good if they sat in a drawer and if we didn't like them we wouldn't wear them. I can attest to that. Did I mention how comfortable they are???? Lymphedivas compression sleeves and gauntlets are made in the U.S.A of American fabrics, shipped by an American company but are happy to ship world wide for those of you are are interested in such things. They are the little guys....Jobst and others making this type of thing are not U.S. companies and are HUGE. I have to say I wear these much more than my other THING and it is much more comfortable. You can get them online from Lymphedivas, but they also have links to retail stores and online sales elsewhere. Right now they are sold in about 250 retail places around the world. Their website has a lot of information and information on sizing, although I'll tell you you HAVE to have someone measure you. You can't do it yourself and I'd go so far as to say that if you have a Lymphedema therapist, they would be a good person to have measure you for one. They come in 2 compression measurements and you'll need to know which you need....again, a therapist question. Yes, they are expensive, and I don't know about how insurance would play into it.....However, if you sign on to the Lymphediva website, they do have specials from time to time. Right now they are having a Cupid's Sale several of their pink toned gloves/sleeves are on sale and a limited edition crystal heart is available on the solid and natural colors for an additional $15 from now until they run out or Feb. 14th. Also, buying the combinations of gauntlet and sleeve together will save you some. Lastly, they do sell seconds, and they have a clearance section which can also save you some cash. And yes....I would buy them again and I will. You owe it to yourself to go to the Lymphediva website and read about Rachel, and go through all the information there is there. Its fascinating, although Rachel's blog is heart breaking as well. I would have loved to have met her. Unfortunately, Rachel died from a recurrence January, 2008 at age 37. Her parents and brother have continued the company. I'm really glad she created this company. I'm grateful to Josh for the time he has spent talking to me about the products and for giving me the opportunity to share what I think about them with you. Oh yeah...and as a disclaimer: Lymphediva's supplied me with the gauntlet, sleeve and informational materials. I have not been compensated for this review, nor do I have any connection with the company other than I'm very happy with their product and think its really cool! I just caught up with your wonderfully well written and inspiring website Lisa. HAPPY to see the gauntlets were worthwhile and you can wholeheartedly give them a good review. Your good karma steered them your way - and I was delighted to be along the route. HEARTENED by your continued wise commentary on the magazine articles or books or life experiences of yourself and others that inspire you. I came across your blog and wanted to say thank you for writing and sharing, it has really touched me. Your information on the gauntlets will be very helpful to people also suffering. Hi, those are neat! its nice that those are made for those who are battling cancer and still want to be styling! As of now, I dont have this issue, but i dont know what lies ahead of me. I will remember this. I was diagnosed Stage 4 end of sept.
Glad to see you post..Yes, I had no idea that I would end up with it sooo much later! I remember your initial post not long after your diagnosis....Stage IV is different....hope you're doing well!